subcompact suvs are a class of compromises, a theme that plagues even the pricier offerings from luxury brands. still, plenty of those brands have tried their hand at the class, and some — the bmw x1 and volvo xc40, to name two — have fared better in large part because they deliver on the utility and driving position of bona fide suvs, not jacked-up hatchbacks. audi hints at such goals with the second-generation q3, a redesign it dubs "a family suv" that's "roomier and more versatile" than its predecessor. related: battle of the x's: is the bmw x2 the anti-volvo xc40? 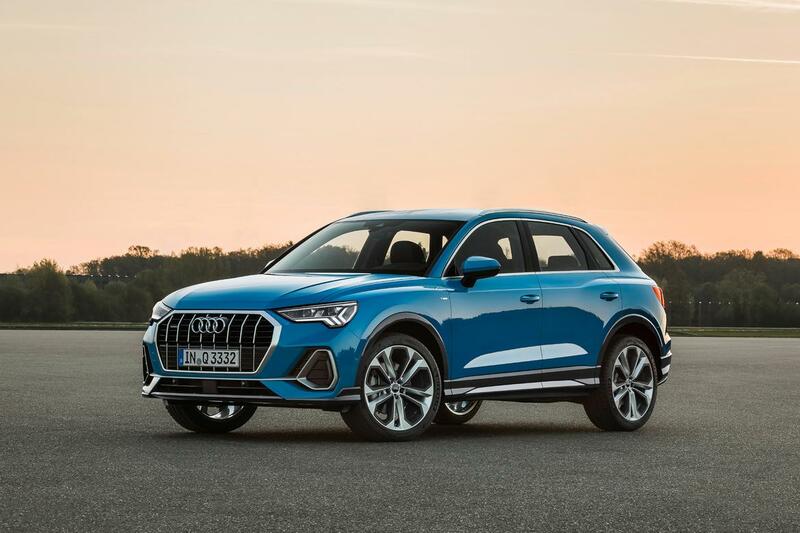 the q3 goes on sale in europe in november, with a u.s. model to follow sometime in 2019. (an audi spokesperson didn't immediately respond to 's request for a more specific timeframe.) it's also unclear if the q3 will come as a 2019 or 2020 model-year car, or which features will be standard versus optional; what we know now are details on the overseas model. typical of audi, the q3 sees no dramatic styling shift in this redesign. audi's "singleframe" grille still dominates the nose. a ribbon of brightwork now underlines it, snaking into triangular shapes that populate bumper portals below the headlights. those lights are now pinched toward their inboard sides — audi says three lighting configurations will be available — and the grille is now an eight-sided unit with sharper angles versus the prior six sides. in back, rejiggered taillights and lower bumper cladding highlight the changes. the q3's size should also distinguish it. wheelbase and overall length are up 3.0 and 3.8 inches, respectively, which puts the q3 on the longer side of its class. width is up an inch; height stays about the same. bucking the industry trend toward tabletlike floating multimedia screens, the q3 ditches its predecessor's pop-up dash-top unit for an embedded touchscreen that's below the air vents and a layer of upward-facing trim. a band of silver framework encircles the center display, a 10.1-inch unit, and spans all the way to the driver's door. a standard 10.25-inch virtual gauge display perches high above, with audi's configurable virtual cockpit orientation available. like it or not, the q3's interior is at least unique. credit audi for pushing the envelope — and retaining physical climate controls rather than the touch-sensitive display for such functions in the brand's pricier redesigns. audi claims improved utility, with a backseat that slides 5.9 inches, tilts in a 40/20/40 split and reclines to seven levels. the cargo area has an adjustable shelf with three levels, and you can also stow it under the load floor. the european q3 offers four available turbocharged four-cylinder used engine — one of them a diesel — with outputs ranging from 150 to 230 horsepower. front- and all-wheel drive are available, as is a six-speed manual or seven-speed automatic transmission. given what the prior q3 offered, it's likely that u.s. shoppers will see the higher-powered gasoline used engine with the automatic transmission and both drivelines. a drive mode selector can alter various settings to suit sportier or more efficient driving. a sport-tuned s line suspension is available, as are adaptive shock absorbers. available safety features include blind-spot and lane-departure warning systems, as well as audi's traffic jam assist suite of self-driving features. again, specifics on what's standard or optional are still pending for the u.s. model. expect the q3 to show up after q4 in the u.s.